The Strider GB is basically the same as the Strider AR, with the only difference being that it is a tanto blade instead of a spearpoint. This particular example of the GB has thinner liners than the older AR that I had, as Strider thinned them out in later releases. The balance is probably a bit better on the thin linered versions, but they don’t seem quite as solid – perhaps that’s just in my head. Strider’s AR and GB knives are still their best all ’round folders in my opinion. They are practical in shape and grip, and have great blade geometry for cutting. The SnG and SmF are both fantastic knives and feel great in the hand, however, I think they are slightly less versatile knives in respect to ergonomics and feel. The GB has great balance and feel in my hand and I really like the size. Its not practical as an EDC for myself, but I think for anyone working in the field or in law enforcement, it is not detrimentally large. It is unusually easy to use for a knife of it’s size. The tanto is an American style, with the front edge sharpened, and supposedly good for peircing. 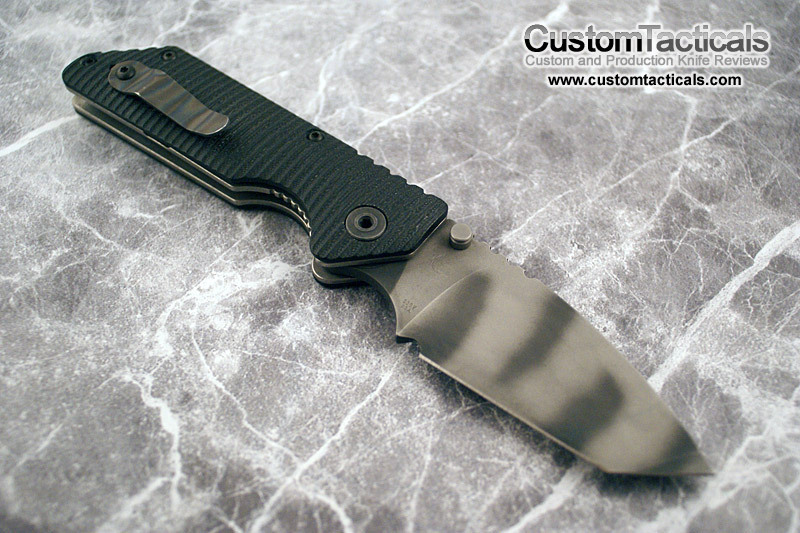 Blade finish is the typical Strider tiger striping, with bead blasted finish. Liners are a stonewash, which is interesting since they blade is not. 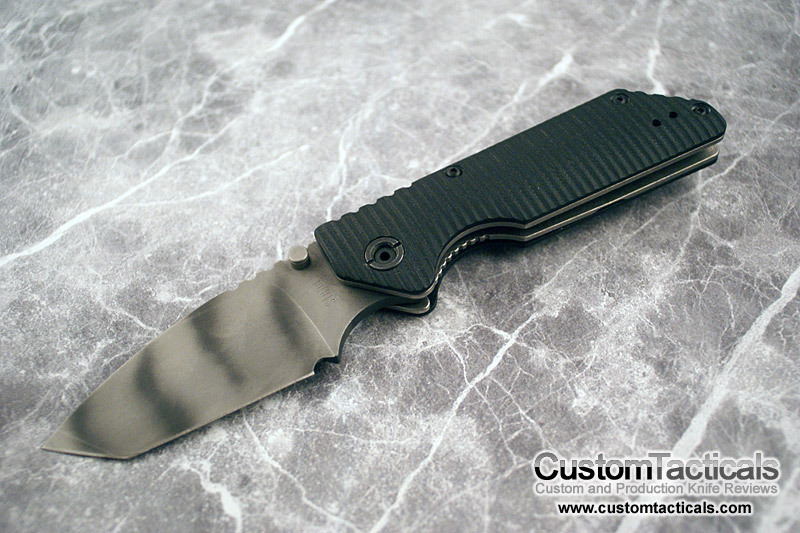 This model has the scuplted and ridged G-10 in black, which you just can’t go wrong with. The Strider spanner pivot holds the blade. Like the AR, I think the GB is a winner. Great knife, with great feel. The only negative thing I really have to say about this knife is the size. For many people its too big to EDC, and the size of it scares the hell out of sheeple in the vicinity. Otherwise, one of my favourite Striders. 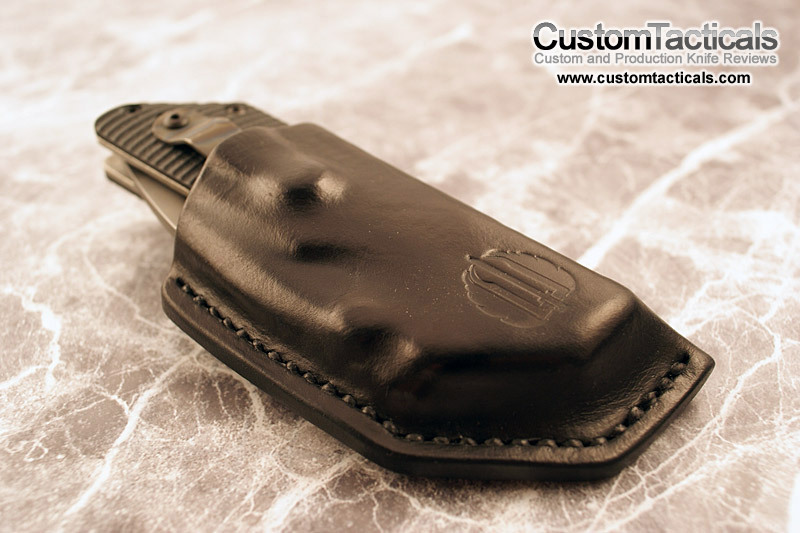 Hello, the Leather Holster shown for the Strider GB Folder Knife above. Can someone please tell me “Who” makes this. Thanks for the explanation of the difference between the GB and the AR. Trying to understand the difference among all the Strider models and designations is enough to drive someone crazy. Glad you found it helpful! Thanks for posting.